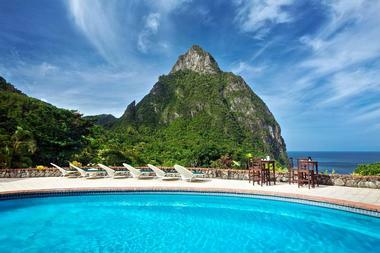 Saint Lucia is home to both luxury all-inclusive resorts and intimate all-inclusive boutique hotel resorts. Though it excels at romance from champagne sunsets to candlelight dinners, it also offers plenty of activities for adventurers and families alike. These 25 all-inclusive resorts in St. Lucia offer every traveler to the island a little piece of paradise. Coconut Bay makes it easy to book a vacation full of unique experiences. The resort hosts a variety of activities, including kite surfing, bicycling, exploration trips, and rainforest zipline adventures. Besides featuring outdoor excursions, the resort also accommodates guests looking for luxury with their 11,000-square-foot full-service spa, complete with two saunas, two steam rooms, a relaxation lounge, and atrium garden. The spa menu includes manicures, pedicures, hair styling services, body scrubs, and a variety of massages. After a day of adventure and relaxation, the hotel provides top-of-the-line entertainment with the island’s most popular musicians performing on select nights. Other events include an adult-only nighttime pool party, a karaoke night, and a country western dance night. Magical is the best way to describe The Landings St. Lucia, a resort dedicated to providing guests with an authentic St. Lucia vacation experience. The all-inclusive resort, located on the northwest coast, is an oceanfront property with sweeping views of the turquoise Caribbean. Independent adventurers enjoy setting off with complimentary use of snorkeling gear, kayaks, and stand-up paddleboards. Other activities include golfing, hiking, and a year-round calendar of events. Each of The Landing’s luxury villas features a furnished terrace overlooking the magnificent scenery and the resort’s luxury yacht marina. For guests who can’t get enough of this vacation experience, resort residences are available for purchase. 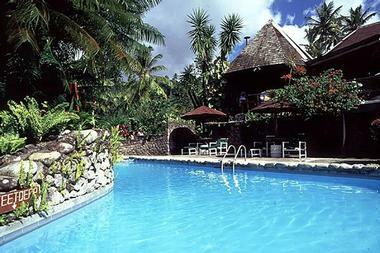 Stonefield Estate Resort is situated in the rainforest of St. Lucia’s dramatic west coast. Semi-outdoor villas at this all-inclusive eco-resort were designed to blend harmoniously with their natural surroundings. 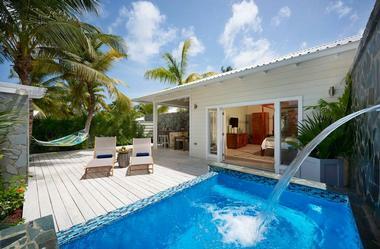 Each of the 16 standalone villas features a private plunge pool and outdoor shower surrounded by tropical flora. Villas come in eight styles, including one, two, three, and five bedrooms. Guests can choose mountain, rainforest, or ocean views. The Mango Tree Restaurant is the resort’s signature restaurant, and serves island dishes sourced from local and seasonal ingredients. Escape Spa combines traditional St. Lucian treatments with modern spa services and techniques. This resort also offers a yoga studio and fitness center. For the health conscious, Body Holiday has created a menu of personalized itineraries, which feature diverse activities from swimming to meditating to dancing. Many months have different themes focusing on a singular goal. For instance, Jive June offers a wide variety of dance classes including salsa, Zumba, and hip hop. Numerous sport, fitness, and recreational activities are available all year round. Rooms, suites, and villas are luxurious and pampering, right down to their personalized pillow menu, where guests choose their own preference. The all-inclusive resort provides five restaurants, including Ayurvedic culinary options. The Wellness Center addresses a lifetime of well-being, from restorative beauty to mindfulness to better aging. Calabash Cove Resort & Spa Hotel is the perfect place for romance. For the couple who loves the water, a swim-up cabana-style room provides direct access to the pool, allowing guests to go whenever they please. For the truly luxurious wedding ceremony and reception, couples can buy out the entire property for their wedding event. Whether it’s been one year together or sixty, the hotel gives every couple the chance to create romantic memories sure to last a lifetime. For those considering tying the knot, the hotel also provides a moonlit setting for a perfect proposal. Now that’s something to say “yes” to. 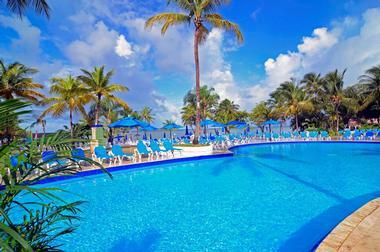 The Coco Palm Resort located in Rodney Bay Village caters to travelers who want to be treated like family. Guests can choose from a variety of unique room choices, from a room that allows you to jump right out of bed and into the pool to a garden-facing room for guests who want a bit more privacy. The Ti Banane, a fine dining restaurant located in a plantation-style house, provides a bit of local flavor, while the Creole Grill & Brown Sugar Bar is a laidback restaurant with local delicacies like curry goat and salt fish on the menu. Art, music, and nature lovers can find both romance and adventure at Anse Chastanet, located on the beautiful white sand beaches of St. Lucia. The environmentally conscious resort was carefully built to showcase the island’s natural flora on its 600 acres. Unique photography classes and art festivals in the summertime are only part of the experiences art lovers can take part in during their stay. The luxury resort harbors a marine reserve and promotes energy saving in the rooms. Part of a UNESCO World Heritage Site, this all-inclusive resort consists of two bays with crystal-clear water and colorful coral reefs – two of the most beautiful reasons to visit St. Lucia. A boutique resort hidden among the lush landscape, East Winds Inn has the ambiance of an island secret. The inn consists of 30 cottage-style suites embellished with flower vases and gracious touches to create a feeling of familiarity. Three oceanfront rooms and one oceanfront suite offer Caribbean views and share a relaxing island lounge. 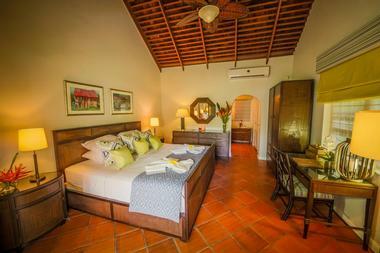 Deluxe cottages are located in a lush tropical garden landscape. Superior cottages are close to the resorts many amenities, including the pool, beach, restaurant, and bar. Guests can join free tours of the property’s 12-acre tropical garden with 100 species of plants, trees, and birds. This all-inclusive also offers numerous watersports. For travelers who love art and architecture, Jade Mountain Resort, designed by Nick Troubetzkoy, is a visual and sensual stunner. The resort, which was envisioned to merge harmoniously with the natural landscape, features a variety of suites, aptly referred to as sanctuaries. Many of the sanctuaries – Star, Moon, Sun, and Galaxy – each feature a private infinity pool with sweeping views of the Caribbean. 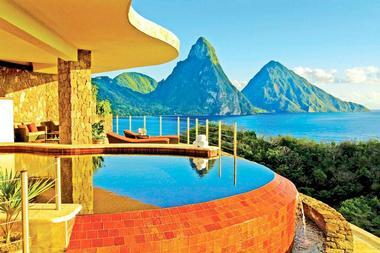 Suites on the lower hillside level of Jade Mountain, called Sky Jacuzzi Suites, feature Jacuzzis with an open wall facing the lush hills and clear waters of St. Lucia. Jade Mountain Club is the all-inclusive resort’s signature restaurant, which wraps around an infinity pool and offers diners dramatic views. As St. Lucia’s only resort located on a UNESCO World Heritage Site, a volcanic ridgeline 1,000 feet above sea level, the Ladera Resort features a truly breathtaking experience. Each of the 37 rooms and suites offers extravagant accommodations for couples and adults, with an “open wall” to enjoy the view of the Pitons and the Caribbean Sea, a private plunge pool, and even a “necessaire kit” to view the clear nighttime skies. The resort also boasts authentic local cuisine and spa treatments inspired by the volcano and the rainforest. Locally harvested tropical hardwoods, stones, and tiles, complete with furniture handcrafted by local artisans, showcase the resort’s dedication to sustainability. The Marigot Bay Resort and Marina by Capella offers a variety of accommodations, activities, and amenities for all guests. Travelers will be welcomed with open arms from the moment they step off the plane into paradise. Marina Village encourages locals, boaters, and guests alike to explore various restaurants, outlets, activities, and services, including water-based tours and a farmer’s market featuring traditional food and crafts created by local artisans. All marina guests have access to the resort’s facilities free of charge, including a spa, a fitness suite, two infinity pools, two poolside bars, and an array of international cuisines to please any palate. Situated on Reduit Beach in Rodney Bay, Papillon by Rex offers activities, entertainment, and services for the entire family. Guests can take advantage of the crystal-clear waters of the Caribbean Sea to relax under the sun and participate in numerous watersports and activities. 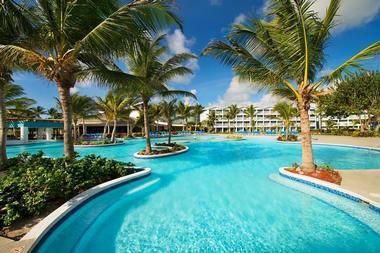 The resort provides four restaurants, two bars, a spa, and an ocean-facing pool. Only a short walk away, Rodney Bay hosts a shopping mall, marina, restaurants, and other attractions. This luxury all-inclusive is an all-suite property. Families traveling with young children can take advantage of the Rexplorers program, available for kids aged 4 to 12. There is also a children’s outdoor playground and childcare services for hire. Rendezvous Resort in St. Lucia, which describes itself as the world’s first boutique resort, may possibly have some of the most modern amenities in the Caribbean. Visitors may choose from five holiday experience themes to set the mood for their romantic getaway, surrounded by two miles of white sand beaches and exotic gardens. Activities and experiences are available to enhance every traveler’s experience, considering all tastes, interests, and personalities. Offerings range from tai chi classes to mixology lessons. In addition to five-star accommodations, Rendezvous Resort offers nightly entertainment, land and water sports, three restaurants, three bars, and unlimited use of the resort’s facilities. Royalton Saint Lucia has luxury accommodations that appeal to all guests, from the Resort and Diamond Club rooms and suites to the adults-only Hideaway accommodations. An upgrade to Diamond Club offers premium services, including butler service, an exclusive beach area, preferential restaurant reservations, and exquisite food served in the Diamond Club lounge. Youth activities are also available. Children aged 4 to 12 can participate in the Clubhouse Kids Club and the Kids’ Adventures programs. Teenagers can spend time in the Hangout Teens Club and enjoy age-appropriate outdoor activities. For guests who want to celebrate a special occasion, whether with friends, family, or a significant other, several vacation packages are available to create the trip of a lifetime. Described as the “closest vacation to a picture-perfect postcard,” Sandals Grande St. Lucia Spa and Beach Resort displays stunning views of volcanic mountains, calm ocean waters, and a mile-long beach, all situated on its very own peninsula. The resort also features six pools, five whirlpools, and seemingly unlimited land sports, water sports, and scuba diving. Visitors will enjoy a truly global dining experience with unlimited dining and spirits provided at the resort’s 12 restaurants and six bars, which increases to 27 restaurants for those who participate in the exclusive exchange program with the two other Sandals St. Lucia resorts. The Sandals Halcyon Beach St. Lucia features a “quintessential Caribbean” experience lined by an unspoiled white sand beach. Guests can choose from luxury level, club level, and butler level accommodations, including the Beachfront Honeymoon Butler Suites, which come with a private deck and plunge pool. The resort includes six specialty restaurants and seven bars, including an over-the-water restaurant with fresh seafood and breathtaking views. Visitors looking to unwind can book a treatment at the Red Lane Spa, where European-style facials, scrubs, massages, and body wraps are infused with botanical products. 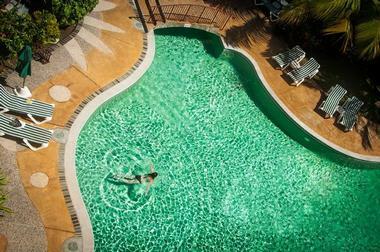 The award-winning resort also features two pools, three whirlpools, and a separate scuba pool. 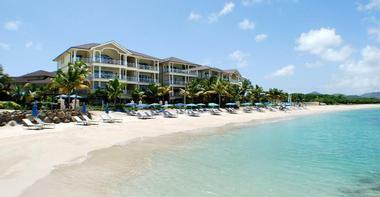 The Sandals Regency La Toc Golf Resort and Spa bills itself as Saint Lucia’s most glamorous resort. The 210-acre estate features oceanfront suites, a private enclave directly over the sea, and an executive-style golf course with a weekly PGA-certified golf clinic. The Sunset Bluff village features a resort within a resort, with 24-hour in-suite dining, exclusive butler service, two-story villas, and private pools. Nine restaurants and eight bars offer a range of international cuisine and premium spirits. The 9-hole La Toc golf course is surrounded by a jungle of almond trees, white cedars, and bamboo, displaying magnificent views and challenging holes. With 36 plunge pool suites, butler service, 24-hour gourmet in-suite dining, and unlimited wine and spirits for all guests, Serenity at Coconut Bay presents a novel philosophy in adult-only sophistication. Spa treatments can be provided in-suite with local organics and complimentary champagne or at the oceanfront Kai Mer Spa with six indoor treatment rooms, three beachfront cabanas, two saunas, two steam rooms, a relaxation lounge, and a salon. Guests can also enjoy the facilities at sister property Coconut Bay Beach Resort & Spa, such as eight additional restaurants, seven bars, five pools, and a waterpark. 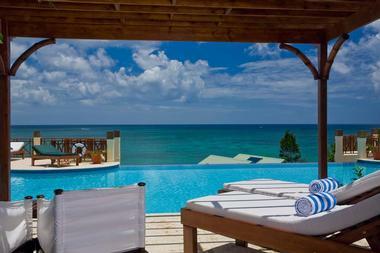 St. James Club Morgan Bay features a relaxed, casual experience for families, couples, and wedding events. Guests can unwind with a visit to the Tranquility Body & Soul Spa for specialty massages, facial treatments, salon services, and day spa experiences for adults, couples, and teenagers. Travelers looking for a bit of adventure, outings such as deep-sea fishing, rainforest skyrides, ziplining, dolphin and whale watching, a tropical Jeep safari, as well as a trip to the French island of Martinique can all be arranged. Children aged 2 to 11 can have some fun in the Kids Club during the day, and parents can arrange for resort childcare or babysitting services at night. Some visitors to St. Lucia believe that Reduit Beach in Rodney Bay is the most beautiful on the island. 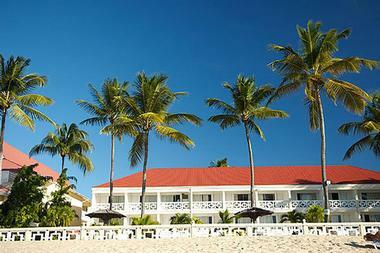 Located right on the beach, Bay Gardens Beach Resort provides for a great romantic getaway. 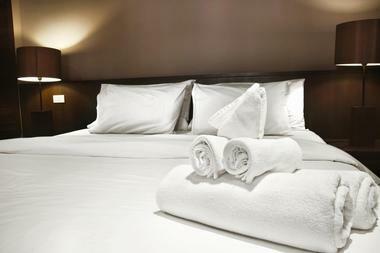 Accommodations include guestrooms, junior suites, and one and two-bedroom suites. All rooms and suites include a private balcony or terrace, with kitchenettes in many. 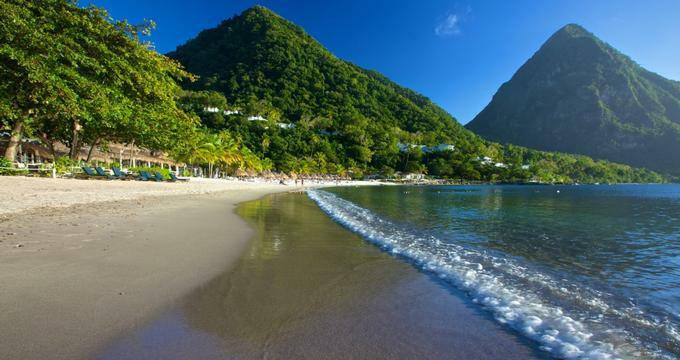 This all-inclusive resort is also the perfect option for budget-minded families or couples who want to spend their vacation dollars enjoying all St. Lucia has to offer. 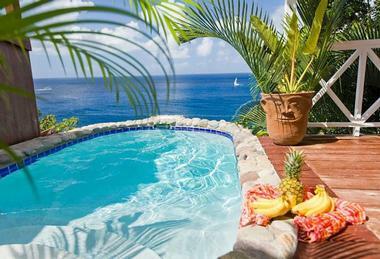 They offer outdoor massages under a gazebo and a hot tub for those that come to St. Lucia to relax. With a bevy of entertainment options to interest guests of all ages, Sugar Beach, part of Viceroy Resorts, is the perfect option for families with kids. Sugar Club allows children aged 4 to 12 years the opportunity to meet other resort guests their age and participate in fun activities including treasure hunts and coconut bowling. For parents who desire a night of privacy, babysitting services are available for hire. Accommodations include luxury guest rooms, villas, and beachfront bungalows as well as two-bedroom villa residences and five new beach residences. Resort activities include watersports and land activities, tours, and family programs. Whether guests want to practice yoga on the beach, go deep sea fishing, or enjoy a wine tasting, the adults-only Ti Kaye Resort and Spa has something to fulfill everyone’s desires. Not only does the resort feature an array of activities popular in St. Lucia, like sailing and snorkeling, they also offer unique personalized experiences. One such experience is the Fish & Farm-to-Table tour, where the resort’s renowned chef takes guests to a market in Anse Cochon for fresh ingredients and then prepares dishes for them. Eating out doesn’t get more personal than that. 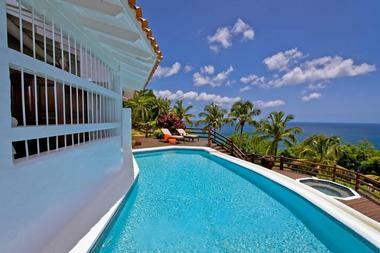 Guests at Windjammer Landing Villa Beach Resort can choose either a beachside or hillside villa, depending on taste. The 64,000 square feet of powdery white sand beach provide an unbeatable Caribbean playground for beachside guests, and premiere hillside villas offer panoramic views from terraces or rooftop decks. 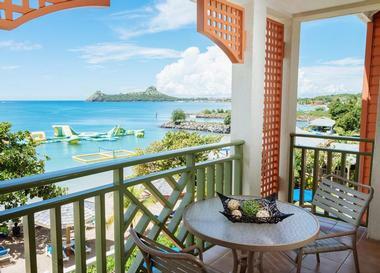 Located along Saint Lucia’s northwest coast in Labrelotte Bay, this all-inclusive resort offers five restaurants, six pools, and three event spaces. For the younger set, the resort offers fun activities like pizza beach parties and dance lessons. Adults can enjoy the resort’s acclaimed spa complete with a private Japanese soaker tub, couple’s suites, and an outdoor shower.